It has 2 fixing holes on the back for easy hanging. 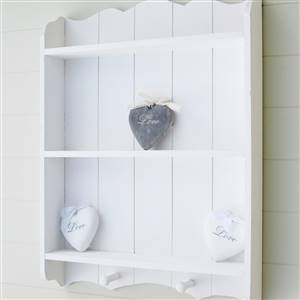 This is such a handy shelf and would look good in a bathroom, kitchen, hallway, study or a nursery as it has so many uses for displaying all your lovely items. Each shelf L 43 cm D 8 cm. Height between shelves 20 cm.